Preheat your oven to the roast setting at 450-degrees. Add in 1 whole chopped shallot, 4 minced garlic cloves, salt, pepper, a few drizzles of olive oil, some white wine and your rosemary. Toss it so it's all good and covered and place in the oven. Shake them a bit 10 minutes into cooking to ensure they get evenly browned up. 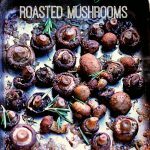 In another 5-7 minutes you will have these gorgeously browned and delicious shroomies! I like to add some fresh rosemary on top to make it look all pretty and festive! For a fun bonus! You can place this pan on the stove once you remove the mushrooms. Pour in some white wine in there and scrub up all the golden brown goodies from the bottom. This technique is called deglazing. Let the wine reduce by half. Pour in a few shots of half and half or heavy cream and you have an amazingly simple and delicious sauce to cover your shrooms, chicken, steak or anything else your heart desires!